November 1, 2010 at 8:00 am. Churches these days receive regular reminders of the need to take stock of their financial health. For some it’s more stringent loan requirements when they talk with lenders about refinancing. Others, while seeing an uptick in giving, still can’t justify the restoration of staff or programs that were scaled back during this recession. Whatever the specific reasons, every church needs to be aware of its financial status. While each situation is different, many churches are finding cash reserves to be a common denominator when it comes to their financial health. Liquidity management may be a complex undertaking, but with a general understanding of what it is and why it’s essential, you can lead your church toward better financial health. There are many complex issues involved with this topic, but the following should help you appreciate the importance of maintaining adequate reserves. Liquidity simply means available funds. The goal of liquidity management is to have enough funds available for current expenses and new ministry opportunities. Managing liquidity is tougher than it seems because income doesn’t always come in when expenses need to be paid. And we always have unexpected expenses. 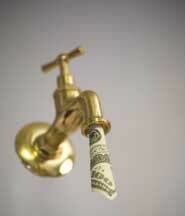 In the U.S., inadequate liquidity is the main reason small businesses fail. At ECCU, we work with more than 2,000 ministries, and for those experiencing financial problems in this economy, inadequate liquidity is a primary issue. One reason liquidity management is challenging is because giving varies month to month and by times of the year. You can’t know for certain how much revenue you’ll receive in a given week or month. You can, however, make good estimates. Start by looking at your past three years’ revenues and current income trends. This can help you predict future income. You also need to know how the economy is affecting your congregation and their ability to give. This data can be used to create a cash flow forecast, which will help you determine whether you will have enough cash when you need it. Similarly, expenses fluctuate monthly and seasonally. As with giving, though, you have records of past expenses that can help you plan for the future. Estimates, of course, are never completely accurate. Variances on either side of the ledger can exceed what you’ve planned. These unavoidable gaps are what make cash reserves essential. There are actually two categories of cash reserves: operating reserves and replacement reserves. Operating cash reserves are set aside for three main purposes: cash flow fluctuation, unplanned expenses or events and potential opportunities. Funds earmarked for cash flow fluctuation are there to keep the church operating when expenses exceed income. As for unplanned expenses or events, a sudden loss of a key donor would be an example of an unplanned event. Exceptionally high heating bills would be an unplanned expense. Potential opportunities are things that align perfectly with your mission but aren’t in the budget. The opportunity to help people in your community after a natural disaster would be an example. Beyond operating reserves, your church should have a separate replacement reserve fund to maintain and replace the things that wear out and break around your facilities. This includes things like resurfacing the parking lot or replacing an air conditioner. Once the replacement reserve fund is established (and it will take time to build it up), you will have funds set aside for these kinds of expenses and won’t have to pull them from other budget line items that could jeopardize your ministry. The goal of evaluating your church’s financial situation, by forecasting cash flow and expenses and considering potential unplanned expenses, events, and opportunities, is to enable you to calculate a target liquidity balance. This is the amount of liquid capital your church should have available at any given time to ensure that ministry can continue uninterrupted. For a novice, what is a good CPU program to begin with to make those financial projections.